In May 2017, Intel commissioned Forrester Consulting to evaluate hybrid cloud adoption, perceptions, and investment plans. 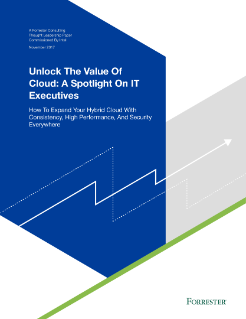 This spotlight focuses on specific findings and considerations for VP and C-level IT decision makers. Forrester conducted an online survey of 148 senior IT respondents from North America, Europe, and Asia to explore this topic. The rapid pace of innovation in both ...public and private cloud platforms is driving strong adoption from enterprises that are building and modernizing the applications that create competitive advantage. Fifty-nine percent of companies today already use multiple public and private clouds to meet different service, performance, and security needs — implementing a multicloud strategy. Leading companies create a true hybrid cloud by integrating apps, services, and platforms using a common software framework, or stack, for greater workload portability on- and off-premises.